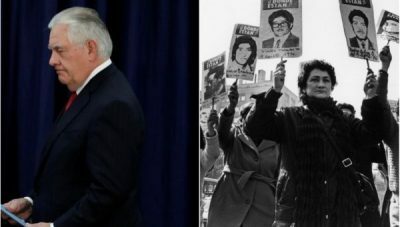 Tillerson said "the military is the agent of change," alluding to the brutal South American dictatorships that killed tens of thousands. “In the history of Venezuela and South American countries, it is often times that the military is the agent of change when things are so bad and the leadership can no longer serve the people,” Tillerson said during a speech at the University of Texas. Speaking ahead of a five-nation Latin America tour, the U.S. diplomat insisted the Trump administration was not advocating “regime change,” but suggested the Venezuelan leader could flee to ally Cuba. While also insisting that the United States wanted peaceful “change” in the Andean country, he suggested that the sort of violence that ushered in bloody regimes like the one led by General Augusto Pinochet in Chile, was a possibility. “Whether that will be the case here or not, I do not know,” Tillerson added. Military regimes took hold of much of South America during the 1970’s and 80’s, often by toppling left-leaning governments with the backing of Washington. These dictatorships, which usurped power in Argentina, Bolivia, Brazil, Chile, Paraguay and Uruguay, led to some 60,000 deaths, thousands of disappearances and exiles, as well as the use of torture tactics. Victims included dissidents and leftists, union and peasant leaders, priests and nuns, students and teachers, intellectuals and suspected guerrillas. Tillerson’s comments come as the Venezuelan government and opposition groups reached a ‘pre-agreement’ on a deal that could help resolve the issues facing the South American nation, including opposition participation in the 2018 presidential elections. The two sides returned to the Dominican Republic to resume peace negotiations under the mediation of Dominican President Danilo Medina, former Spanish President Jose Luis Rodríguez Zapatero and international delegates from Chile, Bolivia, Nicaragua and San Vicente and the Grenadines. These round of talks followed two national elections where the governing United Socialist Party of Venezuela swept most of the positions. Despite the deal, which is slated to be signed on Monday, U.S. officials have stated they will not recognize the results of the Venezuelan elections which are scheduled to take place before the end of April.